I always thought that successful genealogists would get to talk about their own family. Tonight I got the opportunity to do just that. I spoke to the Ozarks Genealogical Society about the 1918-1920 Influenza Pandemic; a topic for which I have great passion. But tonight was more than just an issue, it was about family. It has been 31 years since I spoke in front of an audience in Springfield, Missouri; and 31 years since my grandmother Roma died, on April 12, 1988. Roma married my grandfather, Carl Christian Siegel, in December 1927 and he had died in 1964. Carl had been married before and lost his first wife, who is at the center of this story. Her name was Mary Virginia DeHaven. She was born in Otterville, MO in January 1891 to Loomis S. and Amanda (Homan) DeHaven. 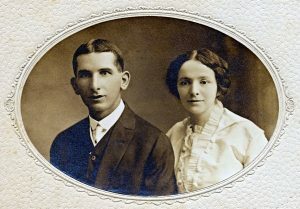 She and Carl married on January 21, 1914 and started a family in their Florence, MO home. Three boys soon followed, Carl (1915) , Pete (1916) and Gene (1918). The little family was happy. Pregnant Mary, Carl and the boys Carl and Peter Vincent (ca. 1917). America got into WWI in 1917, but while Carl was required to register for the draft, at thirty years of age and a family to support there was no reason to think he would be called to serve. Then the influenza epidemic began sweeping the country in the fall of 1918, but again the family was spared. 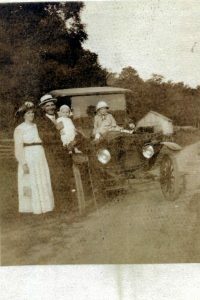 That luck was not to last into 1919, however, when in the late spring both Carl and Mary were sick with the flu. On April 1, 1919, one hundred years ago today, Mary Virginia lost her battle with influenza. Her last words uttered were, “self-sacrifice is a great winning.” She was 29 years old. Eight years after loosing his wife, Carl found love again. He married Roma and enjoyed 37 years together. They had three children and together the family was one. Roma inspired my life and my interest in genealogy, but Mary gave it a purpose – to never take for granted those who have gone before. I recently saw a posting that said, “Walk like you have 500 ancestors behind you.” Today, more than any other day, I have felt their presence. With love to Carl, Mary and Roma, thank you for all you have given to me.